With a new feature in iOS 8, you can use a simple swipe on your iPad to access tools that either mark an email as unread after you’ve read it, which places a blue dot before the message, or flag an email, which places an orange circle before it. These methods help you to remember to reread an email that you’ve already read or to follow up on a message at a later time. 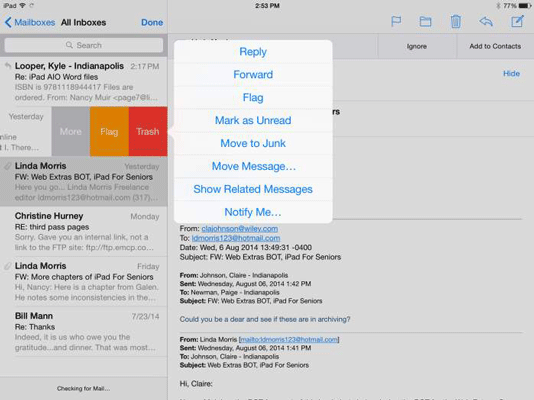 With Mail open and an Inbox displayed, swipe to the left to display three options: More, Flag, and Trash. Note that you should swipe only about halfway across the message; swiping all the way to the left deletes the message. You’re given several options, including Mark as Unread and Flag. Tapping either command applies it and returns you to your Inbox. Note that you can also get to the Mark as Unread command by swiping to the right on a message displayed in your Inbox. Swipe to the left on another email and then tap Flag. An orange circle appears before the email. You can either mark an email as unread or flag it; you can’t do both. Either action provides a unique visual clue indicating that you need to revisit this message before deleting it. You can also select Notify Me. This option causes Mail to notify you whenever somebody replies to this email thread.